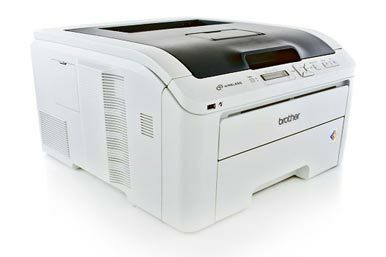 Brother's HL-3070CW color LED printer gives small offices color printing on the cheap, and it has Wi-Fi, too. As is the case with many bargains, however, it makes some compromises, namely in speed and print quality. It also has a few frustrating features. Wi-Fi connectivity is still uncommon among color laser and LED printers, so its presence on the HL-3070CW is a nice bonus. The setup involves a lot of steps, though: For us, clicking blindly through the terse and overly technical dialog boxes proved successful but tedious. Unfortunately, the HL-3070CW is slow and a little clumsy at printing. On a PC, text pages printed at a poky 8.8 pages per minute (ppm). Color speed ranged from 3.5 ppm at default settings on plain paper to 1.8 ppm printing photos on special paper. On a Mac, the HL-3070CW was a little faster, averaging 9.8 ppm with text and 3.6 ppm with graphics. Text quality was as crisp as you'd expect from any laser. All grayscale and color graphics suffered from a grainy effect, however, and color graphics looked pale. The HL-3070CW's feature set is basic (not surprising, given the price). The single, 250-sheet input tray is not upgradable, and the manual-feed slot for thicker media is a hassle because you have to feed the sheets piece by piece. A rear panel folds down to create a straight paper path. On the control panel, the tiny, one-line LCD is unreadable from most angles other than near dead-on. The navigation buttons confused us initially because the cancel and enter buttons are where we expect the left and right arrow buttons to be. Offsetting the HL-3070CW's low purchase price are its higher toner costs. The printer ships with starter-size, 1000-page cartridges for each color and a set of separate drums, also for each color. The replacement black cartridge costs $75 and lasts 2200 pages, or 3.4 cents per page. Each color is priced at $70 and lasts 1400 pages, or 5 cents per color per page. A page with all four colors would cost 18.4 cents. When you hit 15,000 pages of output, you'll need to replace the drums; a new set costs $150, or 1 cent per page. Inserting and removing the toner supplies is very easy, but they don't lock into their bays, which is a bit disconcerting. Keep your expectations for the Brother HL-3070CW as modest as its price. It can add basic color elements to your documents, but smooth-looking photos are a stretch.